Backpackers trim weight in a number of ways, but one of the simplest and most affordable is the humble sleeping pad. The beauty of buying a lightweight pad is that you aren’t necessarily compromising comfort, but as weight goes down you may see durability decrease and price increase. Air pads are the most popular way to go UL, with foam and self-inflating models trailing behind. You’ll notice that there isn’t a huge variety of companies selling sleeping pads—the market is dominated by Therm-a-Rest, Nemo, Big Agnes, and others—but they do offer a ton of variations in terms of R-Values, thicknesses, and price points. To pare down the list and put a proper emphasis on weight, we set a maximum of 1.5 pounds, but also restricted it to models we'd actually tolerate sleeping on—you won’t find any 1/3-inch strips of foam here. Klymit Inertia X Frame 9.1 oz. $80 0.0 1.5 in. 75D 3 x 6 in. Gossamer Gear Airbeam 10.1 oz. $95 Unavail. 1.5 in. 70D Unavail. Exped AirMat Hyperlite 10.8 oz. $109 1.9 2.8 in. 20D 2.8 x 7.1 in. Therm-a-Rest NeoAir XLite 12 oz. $160 3.2 2.5 in. 30D 4 x 9 in. Klymit Inertia Ozone 12.2 oz. $90 0.0 1.75 in. 75D 3.5 x 6 in. Exped SynMat Hyperlite 12.3 oz. $169 3.3 2.8 in. 20D 3.5 x 7.5 in. Exped AirMat Lite UL 5 12.3 oz. $85 1.7 2.0 in. 20D 2.8 x 8.7 in. Sea to Summit UltraLight 12.5 oz. $100 0.7 2.0 in. 40D 3 x 6.5 in. Nemo Tensor Mummy 13 oz. $120 30°F 3.0 in. 20D 3 x 8 in. Therm-a-Rest RidgeRest SOLite 14 oz. $30 2.8 .625 in. N/A 8 x 20 in. Therm-a-Rest Z Lite Sol 14 oz. $45 2.6 0.75 in. N/A 5 x 5.5 x 20 in. Nemo Astro Air Lite 14 oz. $110 35°F 3.0 in. 20D 3 x 8 in. Nemo Tensor Insulated Mummy 14.5 oz. $150 15°F 3.0 in. 20D 3.5 x 8 in. Therm-a-Rest NeoAir XTherm 15 oz. $200 5.7 2.5 in. 70D 4 x 9 in. Sea to Summit Ultralight Insulated 15.5 oz. $130 3.3 2.0 in. 40D 4 x 9 in. Exped SynMat UL 7 15.9 oz. $159 3.3 2.8 in. 20D 3.5 x 9.4 in. Therm-a-Rest NeoAir XLite SV 1 lb. $180 3.2 2.5 in. 30D 4 x 9 in. REI Flash Insulated Air 1 lb. $100 3.2 2.5 in. 30D 4 x 10 in. Sea to Summit Comfort Light 1 lb. $140 1.0 2.5 in. 40D 3.5 x 6.5 in. Klymit Static V2 1 lb. 0.3 oz. $70 1.3 2.5 in. 75D 3 x 8 in. Exped DownMat Winterlite 1 lb. 0.8 oz. $229 7.0 3.5 in. 20D 4.3 x 8.7 in. Big Agnes Q-Core SL 1lb. 1 oz. $160 4.5 3.5 in. 40D 3.5 x 9 in. Big Agnes Double Z 1 lb. 1 oz. $80 1.5 4.0 in. 20D 4.5 x 8.5 in. Nemo Cosmo Air Lite 1 lb. 1 oz. $140 15°F 3.0 in. 20D 3.5 x 8 in. Nemo Vector 1 lb. 1 oz. $150 30°F 3.0 in. 20D 4.5 x 8 in. Therm-a-Rest NeoAir Trekker 1 lb. 2 oz. $130 3.0 2.5 in. 70D 4.5 x 9 in. Therm-a-Rest ProLite 1 lb. 2 oz. $90 2.4 1.0 in. 50D 4.1 x 11 in. Therm-a-Rest EvoLite 1 lb. 2 oz. $120 2.1 2.0 in. 30D 4.9 x 7.75 in. Therm-a-Rest NeoAir All Season 1 lb. 3 oz. $160 4.9 2.5 in. 70D 4.75 x 9 in. Nemo Astro Insulated Lite 1 lb. 3 oz. $130 15°F 3.0 in. 20D 4 x 8 in. Klymit Insulated Static V Lite 1 lb. 3.6 oz. $100 4.4 2.5 in. 30D 5 x 8 in. Therm-a-Rest ProLite Plus 1 lb. 4 oz. $100 3.4 1.5 in. 50D 4.8 x 11 in. Nemo Vector Insulated 1 lb. 4 oz. $180 15°F 3.0 in. 20D 4.75 x 8 in. Nemo Astro 1 lb. 4 oz. $90 35°F 3.0 in 75D 3.5 x 8 in. Exped DownMat UL 7 1 lb. 4.3 oz. $249 5.9 2.8 in. 20D 4.3 x 9.1 in. Sea to Summit Comfort Light Insulated 1 lb. 4.5 oz. $170 4.2 2.5 in. 40D 4.5 x 9 in. Big Agnes Insulated Double Z 1 lb. 5 oz. $110 4.5 4.0 in. 20D 5 x 8 in. REI Stratus Insulated Air 1 lb. 5 oz. $80 2.9 2.5 in. Unavail. 5.25 x 7 in. Sea to Summit Comfort Plus 1 lb. 5 oz. $170 2.5 2.5 in. 40D 4 x 6.5 in. Nemo Cosmo Insulated Lite 1 lb. 5 oz. $160 15°F 3.0 in. 20D 4.5 x 8 in. Big Agnes Air Core 1 lb. 5 oz. $60 1.5 3.25 in. 75D 3.5 x 10 in. Big Agnes Air Core Insulated 1 lb. 6 oz. $90 4.1 3.25 in. 75D 5.5 x 9 in. Therm-a-Rest Trail Scout 1 lb. 6 oz. $50 3.4 1.0 in. Unavail. 5.6 x 11 in. Therm-a-Rest NeoAir Venture WV 1 lb. 6 oz. $70 1.8 2.0 in. 75D 4.5 x 9 in. Therm-a-Rest NeoAir Voyager 1 lb. 7 oz. $90 2.2 2.5 in. 75D 4.5 x 9 in. Big Agnes Double Stuffed Double Z 1 lb. 8 oz. $150 5.8 4.0 in. 20D 6 x 10 in. Alps Mountaineering Ultra-Light 1 lb. 8 oz. $80 3.6 1.5 in. Unavail. 5 x 20 in. Therm-a-Rest EvoLite Plus 1 lb. 8 oz. $150 3.2 2.5 in. 30D 5.5 x 7.75 in. Therm-a-Rest NeoAir Trekker SV 1 lb. 8 oz. $150 3.0 2.5 in. 75D 4 x 9 in. As sleeping pads go, there’s little to debate in terms of the lightest types: air and foam pads take up the top 30 spots on our chart. Air pads are the luxurious ultralight option with thicknesses reaching up to 4 inches. Classic closed-cell foam pads aren’t as comfortable and don’t pack down as small but are great for those on a budget or looking for a pad that won’t deflate. Self-inflating pads, which have a foam core that expands when the valve is opened, are heavier but typically more durable and affordable than air pads. When balancing weight and comfort, the air pad is the clear leader. Transitioning from a ¾-inch foam pad to a 3-inch air pad is night and day in terms of sleeping comfort, and in many cases you’ll save weight and gain some insulation in the process. The main knocks against air pads are durability and price—we’ve popped our fair share and it’s not a fun experience. But if you take good care of them (and bring a patch kit) air pads are well worth it for serious backpacking. Most manufacturers use an R-value rating to measure how well a sleeping pad insulates, and the scale goes from 0 (no insulation capabilities) to 9 (serious insulation for winter camping). For most 3-season use, common R-values are in the 2.5 to 4 range. You can get away with less in the summer if the temperature doesn’t drop overnight (down to 1 or even lower) and will want something warmer for winter camping (look for at least a rating of 5). Some people stack a closed-cell foam pad along with a three-season pad for increased insulation when snow camping. There is a positive correlation between R-value and weight, although it’s not quite as distinct as you might think. Other factors like the type of sleeping pad, denier count of the shell fabric, thickness, and shape play roles as well. All things considered, Therm-a-Rest does a pretty impressive job at providing high R-values at low weights (their NeoAir XLite is 12 ounces with an R-Value of 3.2, for example). They may be more expensive, but it’s hard to knock the quality or specs. Sleeping pad thickness varies wildly from .65 inches for a foam pad up to 4 inches for a cush air pad. Scanning the chart, you’ll see that pad thickness and weight do not correlate strongly. There are more influential factors at play like the pad type and amount of insulation. The ideal thickness varies from person to person and really depends on your comfort tolerance and sleeping style. We’re inclined to choose a thick air pad for the bump in comfort, but if you’re the type that can fall asleep just about anywhere you likely will be fine with a thin foam model. Side sleepers will want a thick pad (around 2.5 inches and up) to keep from digging their hip into the ground, while back sleepers on average can get away with less. The push for lighter but more comfortable pads has put strains on durability. The shell fabric of a sleeping pad in measured in denier (D), and the higher the denier the more durable the pad will be. With sleeping pads, we put an emphasis on the denier count of the bottom fabric—it will have contact with the ground throughout the night and is the most likely spot to spring a leak. 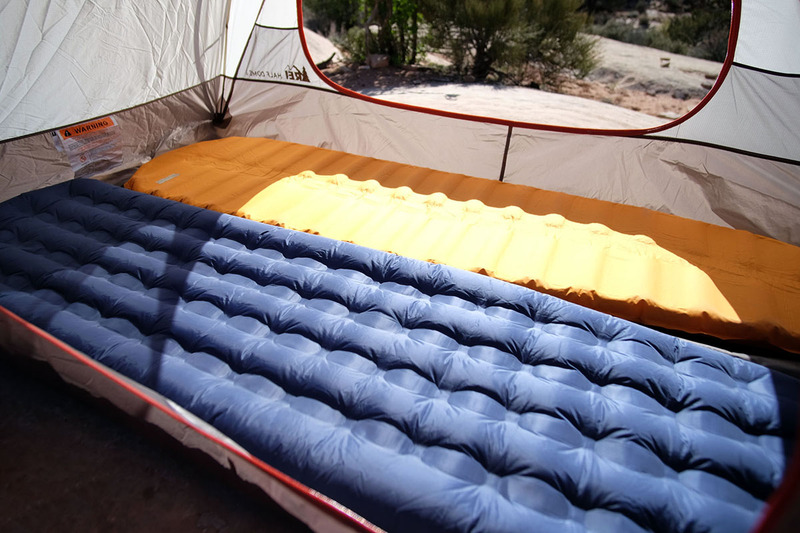 The range for sleeping pads is 20D up to 75D, which is a pretty substantial difference. With an ultralight 20D pad you’ll really want to take care in packing the pad, avoiding abrasions from branches or rocks on the trail (if it’s on the outside of your pack in particular), and choosing good camp sites where it’s unlikely to sustain a puncture. I managed punctured my pad in Utah while sleeping on rock and had a lot to think about through the night. Higher denier counts mean less worry but the pads also tend to go up in weight. Our simple advice is to know yourself as a backpacker: if you take good care of your gear and are okay repairing or replacing a pad should it pop, don’t be afraid to go ultralight. If you tend to be clumsier or don’t want to deal with pad issues, look for a thicker shell fabric. Ultralight materials generally are more crinkly and less smooth than their heavier alternatives. We see this in other gear categories like tents and backpacks, and sleeping pads are no exception. The internal baffling design of the popular Therm-a-Rest NeoAir line generates the most complaints about the noise it makes when moving or turning over during the night. But we think the issue is less of a problem than most make it out to be. First, sleeping in the outdoors always is challenging. As a recent study from Brown University revealed, sleeping in an unfamiliar place keeps the left side of our brain awake. This translates seamlessly to the casual backpacker that gets out one or two weekends a year for a couple of nights. There's little chance those folks will be sleeping all that soundly, no matter the noises coming from their pad. But if you’re sleeping outdoors for long stretches—the exact type of backpackers who need UL pads like the XLite—you’ll probably get over the crinkliness. Not surprisingly, weight and packed size go hand-in-hand. One notable exception is the ultralight closed cell foam pads that aren’t compressible. This is an area where ultralight matters—lighter weight pads use thinner materials and therefore often have smaller packed sizes. Air pads have the smallest packed size and can be easily fit inside the main compartment of a backpack. Self-inflating and foam pads are larger and some models may need to be strapped to the side or bottom of your pack. Along with your tent and sleeping bag, the sleeping pad is one of your 3 bulkiest pieces of gear, so it’s useful to keep its packed size to a minimum. Obviously you can’t split up your sleeping pad like you can with a tent, so you’ll want to find a logical place to pack it and one that won’t get snagged while on the trail. Most backpacking sleeping pads are rectangular or slightly tapered to more or less mimic the shape of your mummy sleeping bag. However, there are a few interesting designs on the market that people use as a means to further cut weight. At the top of this chart are skeleton-like sleeping pads from Klymit, which look just as they sound. Instead of complete coverage between you and the ground, you get a skeleton of a pad designed to cover your contact points and not much else. Insulation is minimal or non-existent and comfort is a matter of personal taste (some people use them on the inside of their bag), but they pack down super small and are relatively inexpensive. Another weight-saving option is a 2/3 or 3/4 length pad that provides coverage for your upper body and mid-section but not your legs and feet. These pads mostly are foam and 48 or 51 inches in length instead of the standard 72 inches (or you can just cut your own). Some people call these “dog pads” because they are, in fact, great for canine companions who like a little R-value too. They also make good places to sit during lunch or around a campsite. With the Z Lite Sol small pad you can save 4 ounces by cutting down the length, but we don’t like this option. You lose insulation by being in direct contact with the ground and sacrifice too much in comfort. Sleeping in the backcountry is challenging enough, so unless you’re a true gram counter we recommend sticking with a full-length pad. There is a small but still important grouping of sleeping pads specifically designed for women. Sharing the same basic design as the unisex pads above, they’re differentiated by a shorter overall length (typically 66 inches compared with 72), increased insulation, and mild changes to the amount of padding in the hip area on some models. Their tuned designs are great for both men and women that don’t need all 6 feet of a standard pad and could benefit from a little extra warmth, just don’t expect any weight savings. The shorter length is offset by the added insulation or padding, so weight is pretty much a wash compared with the regular pads listed above. Getting a lightweight sleeping pad is great, but it’s only one factor is how light your pack is on the trail. To help with research, we’ve also created comprehensive charts comparing backpacking tent weights, one-person tent and shelter weights, and sleeping bag weights. Many of the buying considerations are similar in terms of balancing weight, durability, comfort, and cost, but it makes for some pretty fun research to figure it all out.